As far as we are aware, TOG set up the first lockpicking group in Ireland. Lockpicking has been a part of TOG since 2010, and has always had a good following by its members and friends even to this day. As we don’t always advertise lockpicking on the blog, we do meet every 2nd Monday, I thought it would be a great idea to have a page explaining what we are about, and maybe give us lockpickers a more friendly approachable persona. We don’t bite, promise! Firstly, Lockpicking Group Nights is open to all. Please feel free to come along. They happen every 2nd Monday, begin from 7:30pm usually last for 2 hours thought its not uncommon for us to be still picking after 10pm. The intent for this group night is to get Dublin (and non-Dublin) based lock enthusiasts together to pick locks, show new tools, techniques and make lockpicking more social. Only so much can be done stuck in the workshop, office, or sitting on the couch. Feel free to come along for even just an hour. Our next Lockpicking Group Night is either this Monday or next Monday. It can be found on the left side of our Homepage or our events page HERE. 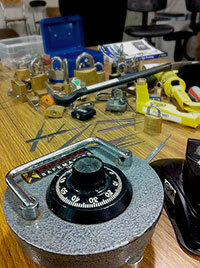 If you are new to lockpicking, you are welcome to come along to one of our group nights. While we don’t run our night as dedicated lockpicking class, we can help you learn the basics, and then the practice is up to you. We have an ever dwindling supply of tools to loan you on the night but to get the most out of lockpicking you really need your own set. These can start at 20EURO and can we can advise you on what to purchase. Feel free to use our loaners for your first time. I would like to make this friendly request. If your sole intent is to learn lockpicking to commit crime and/or aid in an act that is seen to be criminal, please do not attend our meetings or affiliate yourself with us. We do not want the negative attention, and we do this for fun and intrigue, not nefarious reasons. We are a group of lockpicking enthusiasts. A clearer definition of what we do is locksport, but lockpicking has a cooler ring to it. Group nights are free to attend, but if you want to show your appreciation, a donation to TOG is always welcome. It really depends how much time you put into it. We can usually get you to pick at least one lock at your first visit, even if it is a really easy lock. To become a really good lockpicker, it is up to you to learn the technique, and that can take some people longer that others. Same as any skills. Most of our attendees might pick for a few hours a week or only at the group nights every 2 weeks. It is entirely up to you. Where can I buy tools? We sometimes come together to do a group buy of tools among the Lockpicking Group. These are rare and not to be relied upon. We do not know of any irish local or online retailer that supplies lockpicking tools. What tools do I need to have to pick locks? Generally I recommend buying a small set first to see if you like the activity, and you will usually start picking pin tumbler locks. So a basic kit you will need a hook and a tension tool to be able to manipulate individual pins, then some sort of a rake tool for manipulating multiple pins at a time. When you progress you will have multiple hooks, multiple rakes and loads of tension tools. This will build as you get comfortable with your style of lockpicking, whether you want to learn to SPP ( Single Pin Pick) a lock or just rake it and get the darn thing open, or if a certain brand of pick suits you better. Can’t I just pick locks using a paperclip, or make my own? Of course you can, and we have done in the past, but we find bought ones are more resilient to bending and breaking, and this can be a problem if you intend to pick a lot of lock in one evening. What other types of locks are there? 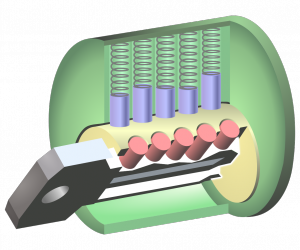 To name a few there are wafer, tubular, dimple, disc detainer and lever. Some manufacturers also have their own version and name for certain types of locks that operate in a similar way. There would be too much to mention here. Do you only pick locks? What about bypass methods? A few of us will know bypass methods for certain types of locks, shims for padlocks for example, it is not our main intention to use them at our to open locks at our group nights. We will of course demo a few is asked or it comes up in conversation. Can I bring my own locks, picks and other crazy locks I have at home? YouTube is a great resource for lockpickers. People put up regular videos of them picking locks, which for more enthusiastic lockpickers is gold! KeyPicking is a forum with a great community of UK Lockpickers with advice, pictures of safe and lock collections. Lockpicking101 is a popular US based lockpicking forum. Lock Wiki is a good resource to view different types of locks. Isn’t it illegal to own lockpicking tools? Can’t I just break into houses with these tools? Officially, under the Theft Act, suspected criminals can be charged with possession of implements intended for use in illegal activity. To the best of our knowledge, none of our group attendees use their skills for illegal activity or intend to do so. If asked, we usually advise our group attendees to not carry their lockpicking tools when not going to and from a Lockpicking Group Nights.